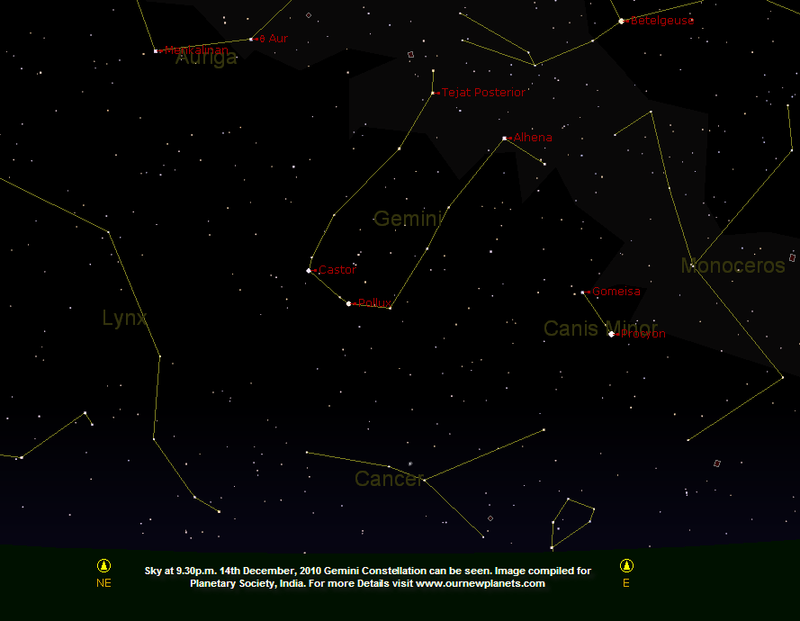 Away from city lights from 7th December, 2010 to 17th December, 2010 people can witness annual celestial spectacle of Geminid Meteor Showers (ulka patham in Telugu/उल्का स्नान) from pollution free dark clear skies. As per the International Meteor Organization (IMO) based on two decades of observation data peak is expected from 12:10 a.m. IST on Dec 14 (i.e.18.40 hrs UTC on 13 Dec) to 9:30 p.m IST on Dec 14 (i.e. 16.00 hrs UTC). 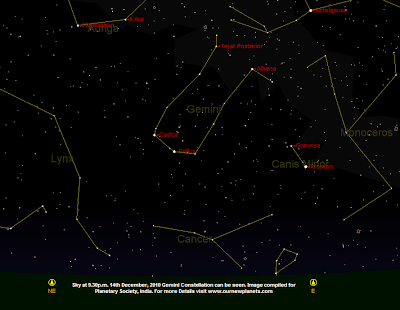 Where to Look/What to expect– No Telescopes Required - Twin Stars of Gemini Const: Though meteor shower is at peak up to 14th Dec at 9.30 pm. Depending on observers location and skies above, many tens of meteors per hour will be visible with highest rates reaching up to a max of 120 ZHR (Meteors Per Hour) as per IMO. 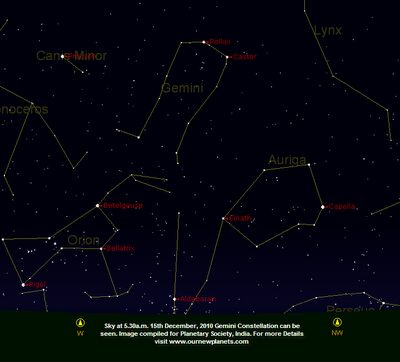 Where to Look: After midnight observers have to look above their head to observe bright streaks of light zipping across the skies. The best time to look above head will be around 1 a.m. when crescent moon sets and the radiant reaches its highest altitude in the sky. Telescopes/binoculars are not required. One can see bright streaks of light zipping across the sky with naked eye and would seem as if they are emanating from star called castor from Gemini constellation where the radiant of this meteor shower lies. 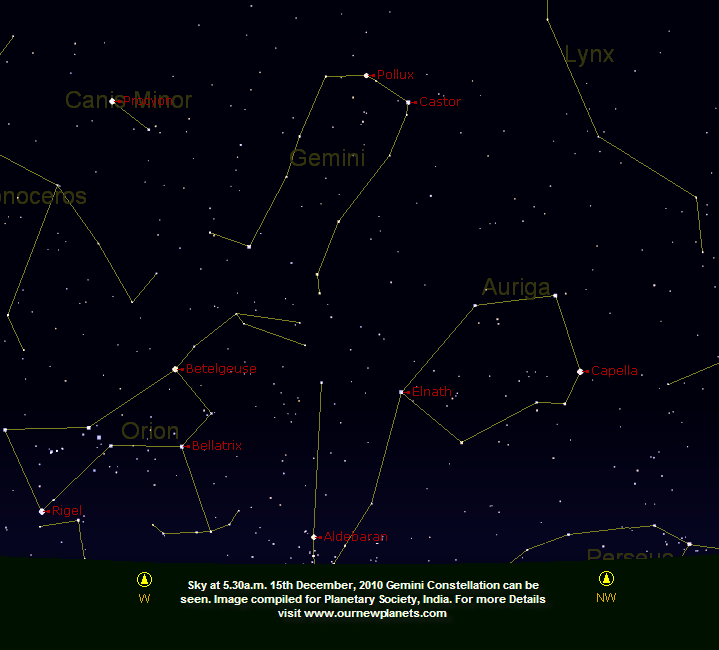 Observation from 14 to 17 Dec During Midnight, Evening/Morning - Follow Twin Stars of Gemini: Though peak is on 14th Dec. People can witness this celestial spectacle until 17th of Dec. All one has to do is to spot Twin Stars of Gemini constellation. Evening: People can observe the meteors by looking towards sky above between North East and East Direction from 10.00 p.m onwards, while they are visible near to mid of sky by the time it is midnight whereas Morning walkers can see meteors in the western sky in the morning. However Moon light being a hindrance to observe the streaks of light produced during the shower, people should wait till the moon sets for splendid view from clear dark skies.